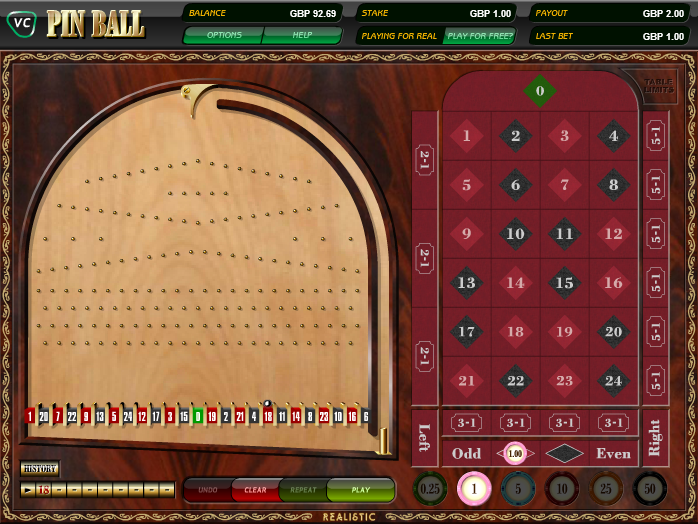 Pin Ball (two words) is a cross between Pachinko and roulette. Instead of 37 or 38 numbers there are 25, and instead of a wheel there is a board with lots of pins with numbered slots at the bottom. The game was created by Realistic Games and is available through Internet casinos using their software. Red/Black: As in roulette, half the numbers are colored red and half black, not counting the zero. Red and black are on the color of the winning number. Wins pay 1 to 1. If the ball lands in zero, then the player loses half. Odd/Even: Bet on whether the winning number is even or odd. As in roulette, the number zero is not considered an even number (even though it is). Wins pay 1 to 1. If the ball lands in zero, then the player loses half. Left/Right: On the numbered slots on the bottom of the board, the zero is in the middle. The left and right bets are on whether the ball will land to the left or right of the zero. Wins pay 1 to 1. If the ball lands in zero, then the player loses half. Single row: Other than the zero, the betting field is composed of six rows of four numbers each. There are six row bets, one for each row. Wins pay 5 to 1. Double row: There are three double row bets. Each covers two rows or eight total numbers. Wins pay 2 to 1. Single column: Other than the zero, the betting field is composed of four columns of six numbers each. There are four column bets, one for each column. Wins pay 3 to 1. Square: There are lots of square bets, each covering four specific numbers. To make this bet, put a chip on the intersection of four numbers. Wins pay 5 to 1. Split: There are lots of split bets, each covering two specific numbers. To make this bet, put a chip on the line between two numbers. Wins pay 11 to 1. Single number: There are 25 single number bets, each covering one specific number. Wins pay 23 to 1. 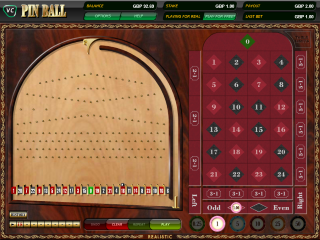 After making his bets, the player will shoot a ball to top of the board. Gravity will lead it through lots of pins to one of the slots below, determining the winning number. The following table shows the probability of a win, half loss, and full loss on all bets. The house edge is shown in the right column. Much like French roulette, stick to the even money bets only, where the house edge is half the other bets.